The Simcoe & District Soccer Club started in 1973 with 83 players, playing at various fields throughout Simcoe, Port Dover and Waterford area. DIRECTORS AT LARGE – ANGELE GEDRIMAS, HALEY SAUNDERS & DAVE ZELDON. Simcoe and District Youth Soccer Club was formed in 1973 by a small group of enthusiastic soccer parents. There were 83 children registered in that first year! The Club grew slowly and steadily over the next 20 years to around 400 participants. In 1996 the organization was incorporated as a not-for-profit organization. Then, with the growing popularity of soccer in North America, we began experiencing exponential growth in the next decade. By 2006, 1200 children, youth and adults were playing soccer with our Club. Today, we continue to see registrations of around 900 participants. Many other developments have occurred since we welcomed in the new millenium. In 2000 we started an indoor soccer season at the Aud in Simcoe, before the millenium we had to use school gyms. We continue to draw over 200 participants a year with 4 divisions. 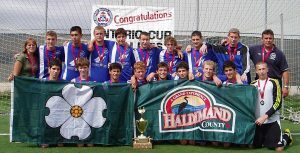 A number of competitive, representative teams were formed, these teams have performed extremely well in leagues across Southern Ontario, often ending up in first place in their respective division. 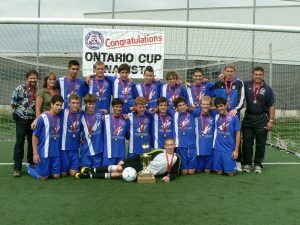 In 2007 the U16 team, coached by Zvonko Horvat advanced to the Ontario Cup final game – a first for our Club! Norfolk County Mayor, Councilors and Staff along with our Community embarked on an ambitious project to build a new soccer park just west of Simcoe. The dream of a new Soccer Park came true in 2003, by 2006 the Simcoe and District Youth Soccer Club had its Grand Opening at the new Norfolk County Youth Soccer Park on July 23rd of that year. In a period of 4 years the Club raised $450,000 and created an important partnership with Norfolk County’s Community Services Department and the Norfolk Pros Foundation. Literally dozens of service clubs and local businesses came to the club’s aid and supported the community’s shared dream for a state-of-the-art soccer park to better provide Norfolk’s youth the opportunity to play soccer on high quality fields. In 2008 the Club embarked in development of Phase II, which will include development of 3 new fields on the west side of the park, which begin in September. They consist of 2 regulation size fields and one “Atom” size field. As well new parking was developed, and irrigation to water the new fields installed. The Norfolk Youth Soccer Park could not of been finished to the point it is for all to enjoy without Nofolk Mayor, Concillors and Norfolk County Staff their help with this big project went from a dream to reality within 10 years and The Board of Directors of the SDYSC and members are very much appreciative of Norfolk County help along with our many sponsors and businesses! With the help of our many supporters and our dedicated Board of Directors and Club Manager, we continue to forge ahead in providing opportunities for youth in Simcoe, Waterford, Port Dover and surrounding areas, regardless of financial, physical or mental ability, gender, or cultural background, to play recreational soccer.